As a living document to the talent of Michael Jackson, even at age 50, and his intent to bow out with the most spectacular tour of his career, This Is It couldn't have been better. One thing becomes perfectly clear upon viewing This Is It: Michael Jackson's final concert tour was going to be a hell of a show. 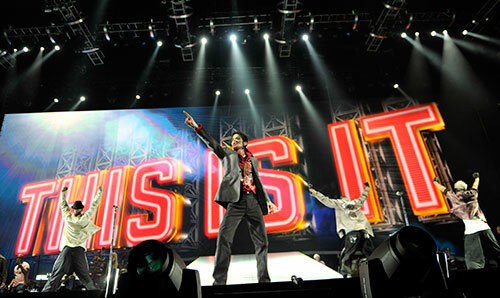 This Is It opens with interviews of Michael's dancers as they auditioned for the honor of joining him on stage. They all regarded Michael the same way; with deep, reverential awe. Then for the next two hours, Jackson earns every bit of that awe. First, there is the music, with Jackson performing a medley of his most crowd-pleasing hits, like "Bad", "Billie Jean", "Human Nature", "The Way You Make Me Feel", "Jam," and "Man in the Mirror". (Michael was shown to struggle a bit with old Jackson Five songs.) The biggest surprise was how much Michael sang. The infamous backing track was present at some points when numbers required heavy dancing, but Michael sang a great deal of his songs (to the point where he admonished himself for "singing out" when he should have been preserving his voice.) Jackson and his team had some awe-inspiring video and special effects planned for the tour. My favorites were the "Smooth Criminal" video, with Michael super-imposed in an old Humphrey Bogart and Edward G. Robinson movie, and the "Thriller" video, which had his dancers as zombies and ended with millions of spectral images descending from the sky. The most fascinating and rewarding aspect of This Is It is watching Jackson at work - the way he interacted with his musicians, dancers, and crew, the way he could hear notes in their performances and find ways to improve or perfect what he was hearing, his insistence on their following his lead when he's "sizzling". Jackson is shown to be a meticulously hard worker who pushed his team, and more importantly himself, to their limits. And yet he was humble and kind, never abusive. This Is It would have us believe creating this concert tour was all harmony, hugs, and uplifting moments of the crew applauding Michael's rehearsals on stage, but, given how things ultimately ended, anyone going to see This Is It is happy with that illusion. This Is It has no time for scandal or sadness. There is no interest in who Michael Jackson was as a person, off stage, or in his private life. This Is It is about the concerts Jackson intended to perform, and by focusing only on how he worked to put those concerts together, Michael Jackson is showcased in the finest light possible: as a consummate showman, a world class musical genius, and as what he was at his very best - the King of Pop. V 1x4 - "It's Only The Beginning"
The Office 6x10 - "Shareholder's Meeting"
Parks and Recreation 2x10 - "Hunting Trip"
Community 1x10 - "Environmental Science"
V 1x3 - "A Bright New Day"
The Office 6x9 - "Murder"
Parks and Recreation 2x9 - "The Camel"
Community 1x9 - "Debate 109"
V 1x2 - "There Is No Normal Anymore"
The Office 6x8 - "Double Date"
Parks and Recreation 2x8 - "Ron and Tammy"
Community 1x8 - "Home Economics"